For the compound butter: Mix all ingredients in food processor and blend until smooth. Reserve. 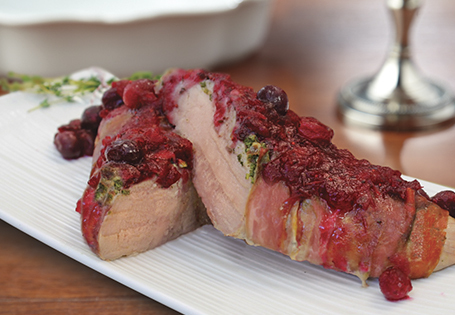 Rub pork tenderloin with butter mixture. Carefully peel slices of prosciutto; wrap tenderloin until completely covered. Place tenderloin in roasting pan, cover with foil. Cook for 45 minutes or until internal temperature reaches 145°. For the chutney: Combine wine, ginger and thyme in a small saucepan. Bring to a boil. Strain, return to heat and add cranberries. Continue cooking until thickened. Reserve over low heat. Slice pork to desired thickness and spoon chutney over pork. TIP: If necessary, to crisp prosciutto: Turn oven to broil and cook for 5-10 minutes until golden brown.